Through smart directing and Reynolds' talent, 94 minutes in a coffin have never been so entertaining. Made for fans of Ryan Reynolds and solid thrillers. Gimmick films usually drive me crazy. By that, I mean films that use a certain mold or idea the entire time just to sound edgy. For example, Enter The Void (another film I reviewed at Sundance 2010) was shot entirely from the first-person point-of-view from one of it’s characters. When he was killed 40 minutes into the film, the camera still followed his perspective as a spirit looking down, observing the world he just left. That went on for 156 minutes. All 94 minutes of Buried take place in a coffin-like box buried in the desert. Not a single frame of film takes place outside that box. When I found out that it was a similar sort of gimmick film along those same lines, I was worried – but I shouldn’t have. You never get bored or tired of Buried and it actually ends up being one of the most tense films you have seen in a long time. Paul Conroy (Ryan Reynolds, X-Men Origins: Wolverine) is a U.S. citizen driving semis for a contracted company in Iraq. The film opens in complete darkness as Paul wakes up in an already-buried box somewhere in the Iraqi desert after his convoy is attacked. The opening few minutes are very much like “buried alive” scenes from Quentin Tarantino’s Kill Bill Vol. 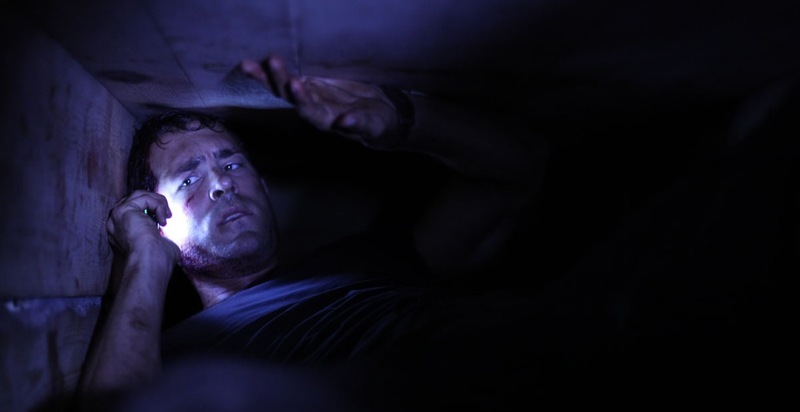 2 – claustrophobic, uncomfortable and intense. After the initial freakout of realizing what has happened and where he is, Paul discovers that it’s just him, a lighter and a limited cell phone. Even though it may sound contrary, Buried isn’t just another gimmicky ploy. It truly never gets old. Director Rodrigo Cortés films in such a way that you never get the tired of seeing the same thing. He tries unconventional camera shots and places the camera in impossible areas to keep it from getting stagnant. Cortés uniquely films Buried in a similar fashion to the way that Alfonso Cuarón filmed Children Of Men (think of the long takes and camera motions within the speeding car). It’s innovation, refreshing and brilliant. Hats off to Ryan Reynolds for being able to carry a movie entirely on his own. He now joins the ranks of Sam Rockwell for being a one-man band (see Sundance 2009′s sci-fi hit Moon, available on DVD and Blu-ray). Luckily, Lionsgate picked up the film at Sundance and is releasing it just in time for Halloween. While not your average October horror film, Buried earns the Halloween release through tackling a widespread fear and achieving an intensity most thrillers can’t get.